Just a quick post to let you know that Google Reader & Google Friend Connect will no longer exist from 1st July '13. I've been meaning to post this for a long long time, but of course I had to leave it till the last minute, like everything else. I feel so sad, because it's been there from the time I started blogging. This Google has made so many changes lately, it's so annoying! Oh, and today I saw changes on my Facebook Page as well. I find both of them so.....what's the word?..... Egocentric. If they were lovers, I would've dumped them long back. *Reminder: Never fix what's not broken. Okay, now the boring-but-important stuff's out of the way. Now I can finish writing my next post for today. Stay tuned! 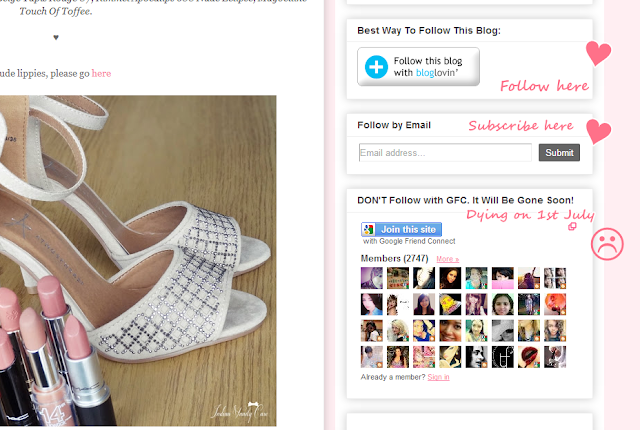 Yey... already following you on Bloglovin'! Oh! How did I not know that?! :D I thought that's what I read! Thanks for telling me! Hun, Google Redaer and GFC are not the same thing. I do think GFC is not going anywhere, at least for now.